Shade Dot is great for window boxes, hanging plants, flower boxes and other hard-to-rig areas where shade tents, shade fabrics and other shade covers just won't work. Ferns love Shade Dot. Sun-loving plants thrive too. Protect your delicate herbs and sprouts from harsh sun. Just place Shade Dot in any pot or in the ground to provide instant shade cover. Attractive and easy. 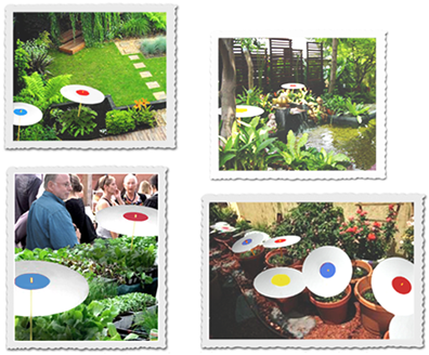 Adjust the angle and height of the Dot as your plants grow. Shade Dot is the only plant shade structure that requires no rigging. It assembles anywhere instantly, providing just the right amount of filtered light and sun shade protection for all plants to thrive. It's great for flowers, vegetables, ferns and other shade plants as well as plants that thrive in bright sun. Creative ideas for Shade Dot you'd like to share? and we'll post them here to inspire other gardeners.